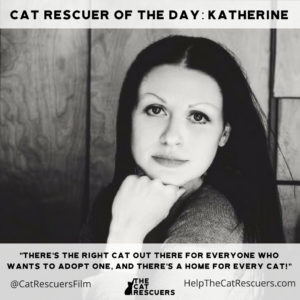 Meet Today’s Rescuer is Katherine A. Moore from Seattle! 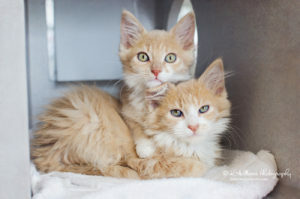 Affiliated with Seattle Area Feline Rescue. 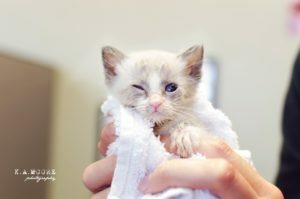 I’m the main photographer for the Seattle Area Feline Rescue, taking the extra special ‘glam shots’ of the cats, especially the ones who need more help to get noticed, such as the seniors and special-needs kitties (which we ‘specialize’ in), and it really makes a difference. I’ve volunteered with the rescue for 6+ years now, doing photos at the rescue, photographing the annual benefit, and helping with marketing, have helped make videos, etc. I originally cleaned cages about 13 years ago but my skills as photographer today are much more helpful to the cats. I’ve put my film, photography, video, as well as veterinary background all together to bring me to doing pet photography today, and I love my rescue work more than anything. There are so many cats I will never forget, and I can look at nearly all my past photos I took of the cats, and remember their names. Some of them make such miraculous journeys with us, that make them hard to forget. I was able to see one of our ‘alumni’ recently, which was amazing; a blind cat called Bindi, who we agreed to have flown up from CA to Seattle, needing extra special care and a campaign to fund 2 eye surgeries to make her eyes more comfortable. The rescue in CA may not have been able to rehome her and may have had to euthanize her, had we not taken her. Today though, Bindi is happy and healthy in a new home (with the foster family who fell in love with her after caring for her after her surgeries and adopted her), and I couldn’t be more pleased to see a sad story turn out so well. I want to one day publish a book of my photography of cats at the rescue and go back and follow up with some of the memorable cats I have photographed and see how they are doing today. I want to share the amazing stories of rescue there, because there are always so many remarkable and amazing stories that I can’t forget and are so inspiring. There are so many unforgettable kitties and just putting together the rescue calendar each year is hard when I want to include so many. There are so many things about cats that I wish people understood, but I do think you need to spend a good amount of time around them to really ‘get’ them. Their behaviors are endlessly fascinating! But one thing that people get wrong is that people don’t think they’re loyal; I think they’re fiercely loyal, and they know exactly what (and who) they want. I think there’s the right cat out there for everyone who wants to adopt one, and there’s a home for every cat! As for cat rescue, I want people to know that there’s always something people can do to help: if you can’t donate, volunteer, if you can’t volunteer, foster. There’s always something you can do! Aside from my photography (and all the editing that has to happen at home! ), I don’t have huge amounts of energy for that much aside from my 9 year-old son, as I have MS, which makes me super tired and I deal with a lot of pain issues, BUT I’m kind of a TV and movie addict, love letter-writing, but wish I had more time to read. 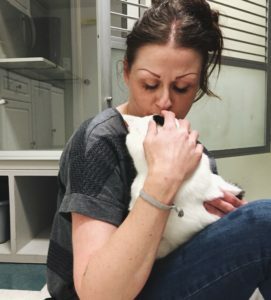 I can’t wait for people to see the community and heart that it takes to help these kitties. I want everyone to know how much work goes into it and to be educated about how the problems can be resolved. Since I also used to work in film and video, I know how hard it is to get a film funded and finished, so I’m definitely behind you!! This needs to get out there! My own site is http://kamoorephotography.com and my Facebook page is http://facebook.com/kamoorephoto – you can find out about my work with ‘Wings of Rescue‘ and the cat rescue too through there, and see all my photography! Supporting my work benefits the rescue as I spend so much time volunteering and documenting and sharing. Go follow Katherine on Twitter and Instagram (@romans_mama). Also, be sure to follow @CatRescuersFilm on Facebook, Twitter and Instagram, and support our Kickstarter – HelpTheCatRescuers.com!